Taking notes is a great way to help students identify the importance of concepts covered in class. Even if you have a great memory, you simply won't be able to remember everything the teacher says. A permanent written record that you can refer to later can prove indispensable when it's time to write an essay or take a test on the materials discussed in class. Literature lectures offer important background information about the works you're studying, including literary terms, details about the author's style, thematic relationships between works and important quotations. 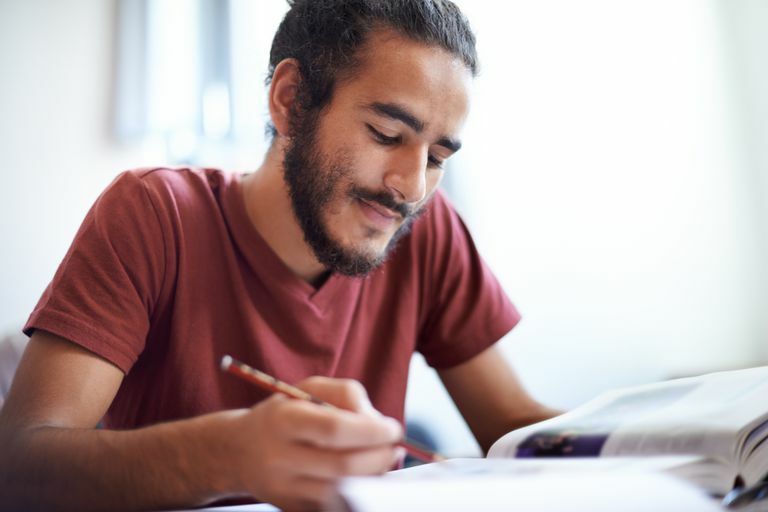 The content from literature lectures has a way of appearing on quizzes and essay assignments in ways students least expect them to, which is why note taking is so helpful. Even if the lecture material doesn't reappear in a testing situation, you may be asked to draw from the knowledge you gained from the lecture for a future class discussion. With that in mind, here are a few tips about how to effectively take notes in your literature class. To prepare for your next class, read the assigned reading material. It's usually a good idea to read the material at least a few days before the assignment is due. If possible, you'll want to read the selection several times and make sure you understand what you're reading. If you have any questions, your textbook may offer a list of suggested readings to help with your understanding. A visit to your library may also offer additional reference resources to answer your questions and further prepare you for class. Your notes from previous class periods may also help to answer your questions. Also, be sure to take a look at the questions that follow selections in your textbook. The questions help you to re-evaluate the text, and they may help you to understand how the material relates to other works you've read in the course. Be prepared to take notes when you attend your class, and be on time. Bring plenty of paper and pens with you. Write down the relevant date, time, and topic details on your notepaper before the teacher is ready to start. If homework is due, hand it in before the class starts, and then be ready to take notes. Listen carefully to what the teacher says. Particularly note any discussion about future homework assignments and/or tests. The teacher may also give you an outline of what he or she will be discussing for that day. Remember that you don't have to get down every word that your teacher says. Get enough written down so that you can understand what was said. If there's something that you don't understand, be sure to mark those sections so you can come back to them later. Since you've read the reading material before class, you should recognize new material: details about the text, the author, the time period, or the genre that wasn't covered in your textbook. You'll want to get as much of this material down as possible because the teacher probably considers it to be important to your understanding of the texts. Even if the lecture seems disorganized get down as many notes as possible through the lecture. Where there are gaps, or parts of the lecture you don't understand, clarify your understanding of the material by asking questions in class or during the teacher's office hours. You can also ask a classmate for help or find outside reading materials that explain the issue. Sometimes, when you hear the material in a different way, you may understand the concept much more clearly than the first time you heard it. Also, remember, every student learns in a different way. Sometimes, it's better to get a broader perspective--from various sources, both in and out of class. If you know you have a hard time paying attention, try some preventative measures. Some students find that chewing on gum or a pen helps them to pay attention. Of course, if you're not allowed to chew gum in the class, then that option is out. You can also ask for permission to record the lecture. You have several options for reviewing or revising your notes. Some students type the notes up, and print them up for easy reference, while others just look them over after class and transfer important detail to other tracking devices. Whichever mode of review you prefer, the important thing is that you look over your notes while the lecture is still fresh in your mind. If you have questions, you need to get them answered before you forget what was confusing or hard-to-understand. Collect your notes in one place. Usually, a three-ring binder is the best place because you can keep your notes with your course outline, class handouts, returned homework assignments and returned tests. Use a highlighter or some system of making the text stand out. You'll want to make sure that you don't miss the details the teacher gives you about assignments and tests. If you highlight important items, make sure that you don't highlight everything or else everything seems important. Be sure to make note of examples. If the teacher is talking about a quest and then talks about "Tom Jones," you'll want to make note of it, particularly if you know that you'll be reading that book shortly. You may not always understand the context of the discussion if you haven't yet read the work, but it's still important to note that the work is connected with the quest theme. Don't just review your notes the day before your final exam. Take a look at them periodically throughout the course. You may see patterns that you never noticed before. You may better understand the structure and progression of the course: where the teacher is going and what he or she expects you to have learned by the time the class is over. Often the teacher will put the material on a test just to make sure that students are listening or taking notes. Some teachers will discuss the complete outline of a test, telling students exactly what will appear, but students still fail because they're not paying attention. Before long, you'll get used to taking notes. It really is a skill, but it also depends on the teacher. Sometimes it's difficult to tell whether a teacher's statements are important or just an offhand remark. If all else fails, and you're confused or uncertain about whether you're understanding what is expected of you in the course, ask the teacher. The teacher is the person giving you a grade (in most situations).